I was about 15 years old when I decided I wanted to do everything homesteading. Together with my parents, I wanted chickens, milk goats, a garden, and a Jersey, I wanted to learn the all the skills involved. To live the homesteading life was my dream! I made it my secret goal to grow everything our family of eight, ate! The problem was—I didn't know how. I knew what I wanted. I knew what I wanted the end goal to be, but I didn't know where or how to start. 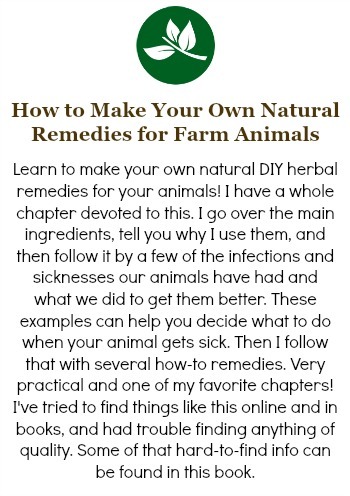 I read lots of homesteading books and websites—everything I could get my hands on. We got some chickens, then a goat. Now, several years later—we're homesteading! Perfectly? No. Is all of our food coming from our land? Not yet, but we're getting closer. We get eggs, vegetables, goat's milk, and hopefully soon cows milk, from our backyard. After all the hard work and trials of the day, it's so satisfying to serve up dinner and say with the family, “The meal on our plates came from the backyard!” We're doing it! We're homesteading. Many people dream of living the homestead life too, but it's not easy. It takes knowledge. You need to know where to start. You need to know how to think in a way that looks long-term, with a consideration for all of the parts of your homestead. Homesteading isn’t an unattainable dream. 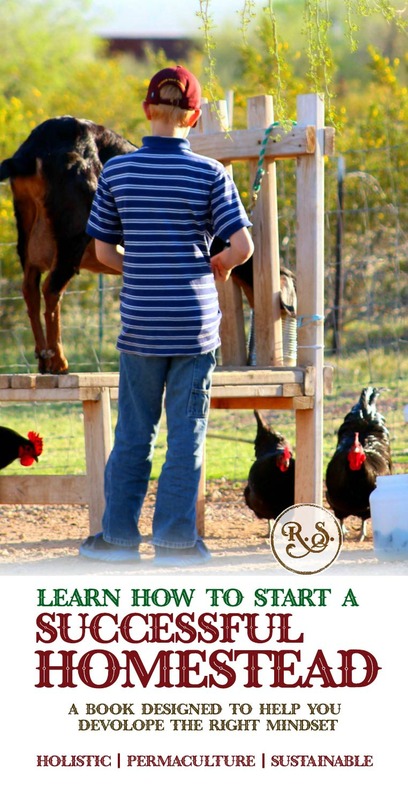 You can live your own homesteading life too! 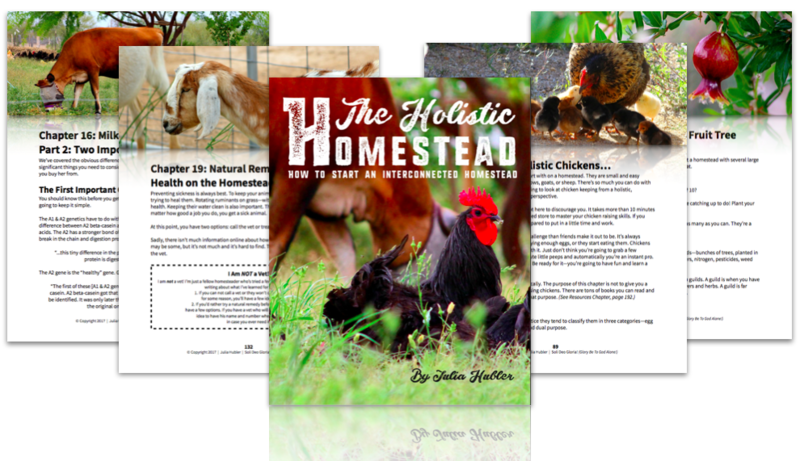 The Holistic Homestead is a vision casting book to get you started on your own natural, holistically-minded homestead journey. A homestead that really succeeds. 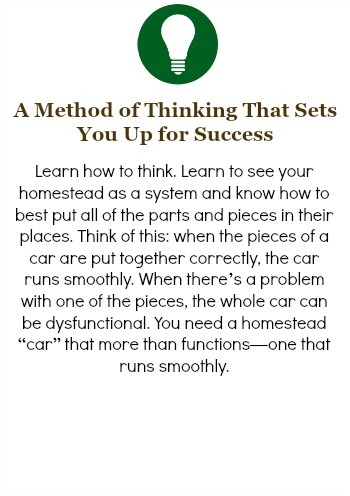 You want to homestead...the problem is unless you have a holistic mindset (a mindset that considers the whole of something) you're not going to make it successfully. One thing I've learned is you must take your entire homestead into consideration at all times--otherwise you will miss something and there'll be a hole in your homestead. The sad thing is, most homesteading books miss this key factor. 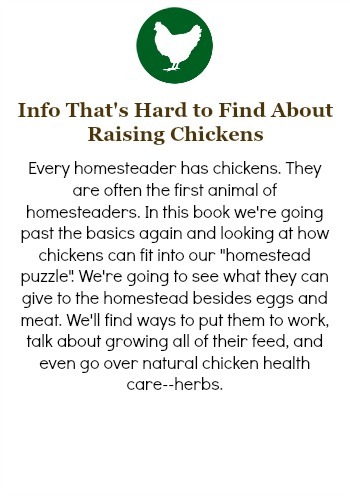 The big over-view homesteading books get so caught up in the nitty gritty details of the individual parts, they forget everything else on your homestead. You need a homestead that's holistic. But what if you had a book that taught you how to think holistically on your own and then gave you countless examples to practically show you how it's done? I'm learning things I didn't know! I grew up on a farm, and some of these things we did, but I never knew the why. Now I do! Julia has done an excellent job researching for and writing this book. It will help you make the most of your homestead, whether large or small. 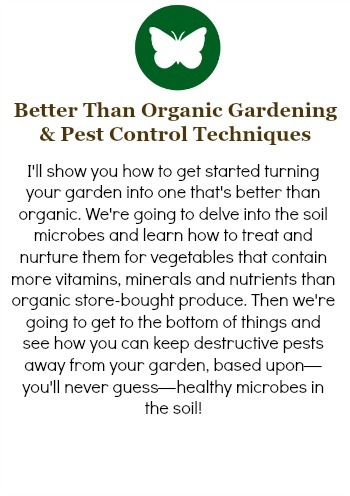 This will make a great addition to every homesteader's library." -Naomi M.
Are you ready? Get yours now! What's Inside? 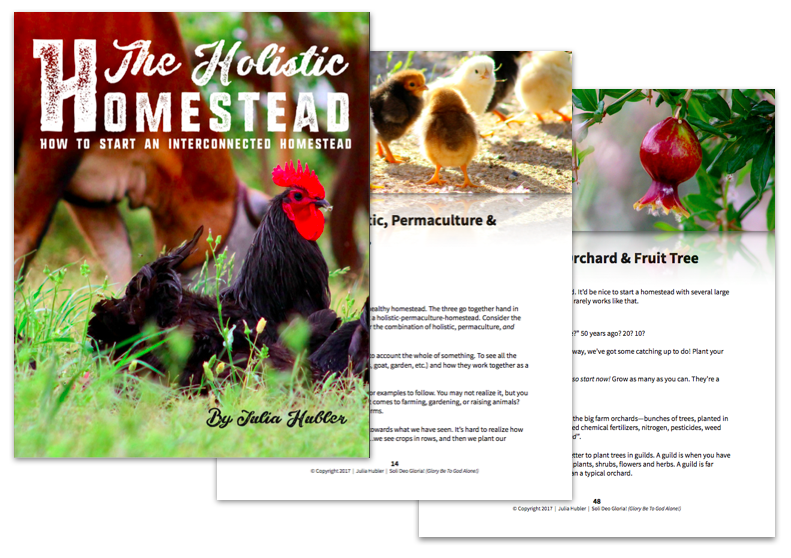 220 pages of homesteading info you can put into action immediately, to grow a holistic homestead that will thrive. Chapter 4: Grass Is Key! 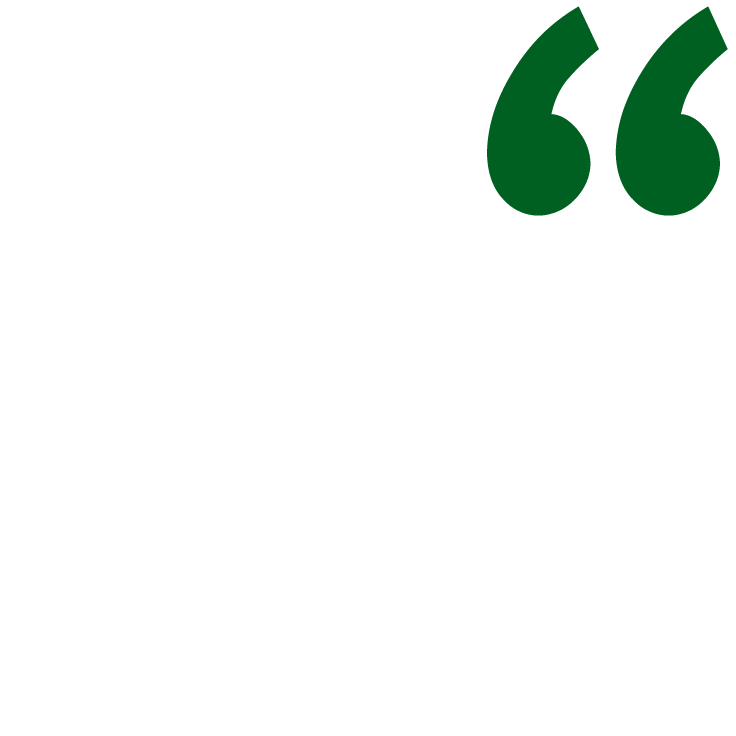 Chapter 10: Weeds—A Problem or Temporary Solution? 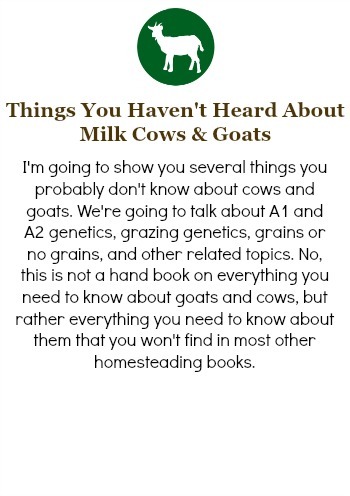 Chapter 15: Milk Cows & Goats, Part 1: Which Is Best for You? Part 4: Put the Pieces Together! 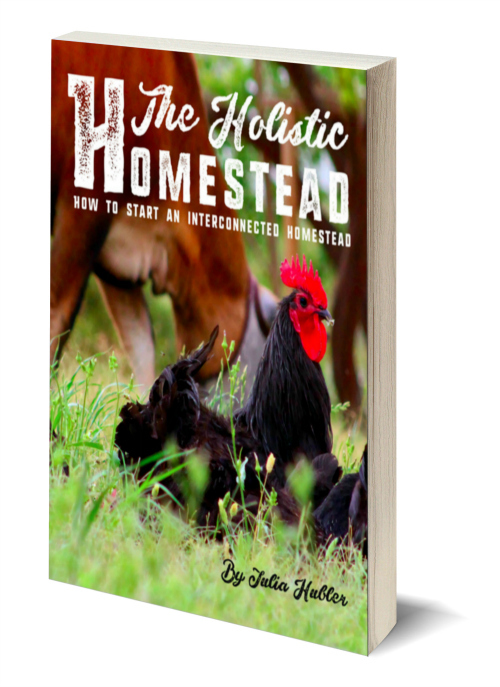 The Holistic Homestead is an essential tool for the avid homesteader! Know where your food comes from, and become independent from the conventional food industry for your own health and for the generations to come. I strongly recommend this book to anyone interested in raising their own animals, growing their own food or maximizing on system efficiency. Hi! I’m Julia. The girl behind the blog ReformStead.com. I write about all things homesteading. 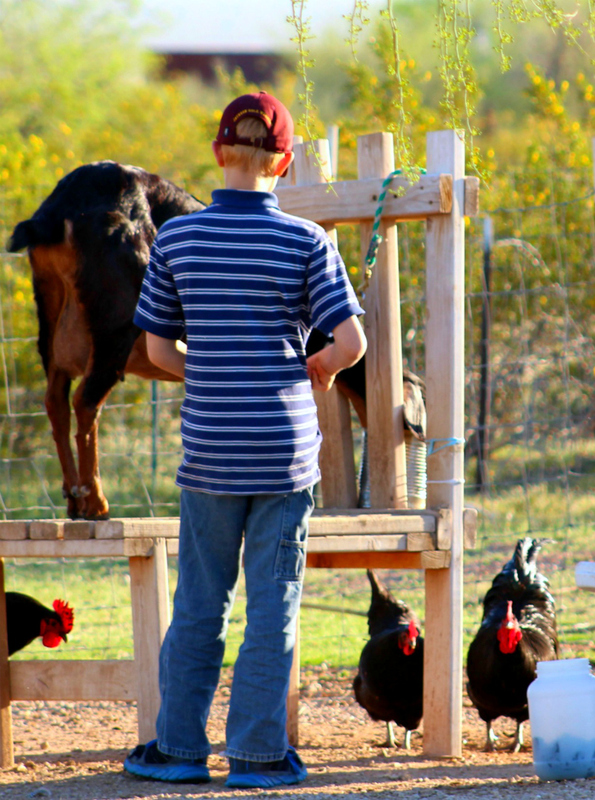 Raising chickens, gardening, from-scratch cooking, milking goats and more. I've seen the need for high-quality homesteading info and literature, presented in an, at least a semi-professional way, and that's how ReformStead.com and my book, The Holistic Homestead came about. The most important thing is my life though is honoring and serving my King, Jesus Christ and learning to make the Bible the guiding light of my life. By His sovereignty, I’m a homeschool graduate and live with my parents and five younger siblings in Phoenix, Arizona. We live on 2.5 acres, with HOT summers, cacti and amazing sunsets! Each morning I wake up my siblings and we head out for farm chores. Some may think my life sounds hard and boring, but I assure you, it’s not. (although the hard part is true sometimes. =) ) I wouldn't trade my life for anything—I love every bit of it! This book is available in two formats. 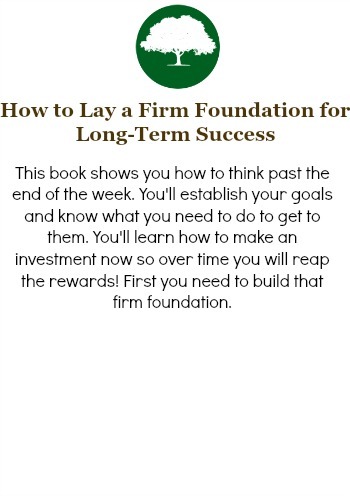 Get it as either an eBook or a print Book (hard copy). Fully clickable—meaning it contains internal links to help to navigate through different sections quickly. An instant download—you can start reading right away! An actual, printed book! Need I say more?